Taking care of your dog does not just include feeding him with a properly balanced dog food that fits his need or taking him to the vet. Aside from all the ones mentioned, you have to give your dogs regular bath. But more than just this, do not forget the next step and that is to dry your dog. Drying your dog’s coat is not just for maintenance purposes but also to make sure that your dog will not shiver or freeze to death. While air drying is an okay method, nothing beats what a dog dryer can do. That being said, in this article, I have rounded off 5 best dog dryer that you can use for your reference. This dryer is a forced-air dryer type. This is also known as a high velocity dryer type. This makes this dog dryer one of the most efficient dryer models. The Metrovac dryer is able to cut down the typical drying time for both the outer coat and the undercoat. This is because this model utilizes an innovative technology called airflow control. Moreover, this dryer model also comes with two different speed settings which lets you adjust. Another good thing about this product is that it has one of the strongest airflow that is good at blowing off fur of shedding dogs. As for the amount of temp, you don’t have to worry about anything because the only thing that warms the air is a motor.As for the structure, the dryer is portable and light but is still very sturdy. This is because this product is created out of steele, one of the strongest materials. Just like the previously mentioned model, the Oster Hi-Velocity dryer is also an example of a cage dryer. One thing that makes it stand out, however, is its size. This one is relatively smaller. But do not let the size fool you though. One of the many benefits this model offers is its three various heat settings. One of the good things about the settings is that it allows you to choose an air only setting. It also has a safety measure. This dryer model is equipped with a thermal overload switch. This auto switch basically allows your dryer to shut off immediately once the model starts to overheat.More than this, this dryer is not as strong as the other models. This feature also allows it to stay quiet during the drying process. This makes it a perfect fit for those dogs that are more sensitive to noise. The Challengair 550 dryer model is a type of a low pressure or cage dryer. This cage dryer type of model is one of the most relatively easiest to navigate. With this model, you will be able to regulate and watch the temperature inside the cage of your dog. You are allowed to maintain the temp at an estimated safe amount of 107 degrees. This feature ensures you that your dog will not end up freezing or shivering and will not end up overheating, as well.Another feature that this model has is a safety timer. This timer allows you to set in advance how long you would want to blow dry your dog. This also stops any possibility of drying out your dog’s skin too much. This model is both foolproof and rust proof. Moreover, this model gives off one of the strongest airflows. This model also has an easy to clean filter because this one has a double air filtration. This model is probably the most budget friendly dryer among the list. This particular dryer is a high-velocity type. This model will best work for pets with thicker coats as they will enjoy the low speed setting. You can use this setting with the four nozzles that this device comes with. To be specific, this comes with a fluffing, cone, slot and brush nozzle. As an additional plus, this dryer gives off less harsh force and is therefore much less noisy as well. This makes it a good fit for dogs that are a bit sensitive to noise. With the XPOWER dryer, you get two functions in one product. 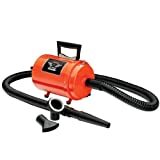 This dog dryer is extremely light, compact and portable, as well. Despite this, this model is equipped with a large amount of power. This dryer also has more than one speed setting. Your dog’s safety is also ensured for this product can only reach a max amount of 106 degrees. Another good thing about this product is that it does not use any heat element but only uses a motor to warm up the air. This assures you that the air will not overheat. This model is also equipped with a flexible hose. With its flexibility, the hose is able to reach each and every nook and cranny of your dog. Blow drying your dog is an essential step and process you must never overlook. Here is a buying guide you can use as a point of reference when planning to get a dog dryer. One key feature of a dryer is that it must use an air with a lower temperature. This may sound confusing considering that for you to be able to dry any material that is wet, you are going to be needing an air that comes in a high temperature. However, do take note that dogs are generally equipped with a higher body temp than us, humans. As a result, dogs tend to have a more sensitive hair, skin, and undercoat. This means you have to regulate the temp of air that you blow dry their hair with to refrain from overheating your dog. Because of this particular feature of dogs, dog dryers are equipped with a motor that allows air to warm up to the maximum level needed. For this reason, you no longer need to use any auxiliary heating element. 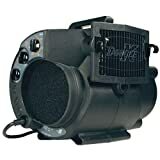 Choosing a dog dryer that comes with a variety of speed options is usually the best way to go. This is the case regardless of how many types of breeds are in your care. Note that the speed you will be using will depend on the breed of dog. With many speeds, you can be flexible and adjust depending on the speed you need and the type of coat you are drying. Dog dryer models like this are versatile, as well. However, you can still get a single speed dog dryer model if that is what you prefer. You can do this as long as you only have one type of breed. Just like any other material, a hose can easily deteriorate if not properly taken care of. An additional factor that contributes to this possibility is the structure and quality of the materials used. When low-quality materials are used to make and produce the hose, the tendency is air pressure and the heat will easily break the hose. This especially happens when one intensively uses the dryer. To ensure the quality of your hose, opt to buy a hose that is not just made out of spiral wound but is also heavy duty. Your need for CFM and horsepower is actually inversely proportional to each other. 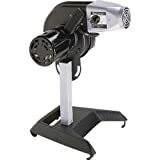 Any dog dryer model that boasts of having a really high horsepower does not really offer that much benefits. Why is this the case? This is because for one to be able to draw a great amount of horsepower, one certain electronic must at least be equipped with 30 amps. This feat can be considered an impossibility seeing as most electronics can only handle up to 12amps. On the other hand, this is not the case for CFM or the cubic feet per minute. This feature is what you should always look at. This certain measurement is how you will know how fast a dog dryer model can dry your dog’s coat or hair. This measurement literally pertains to how swiftly a certain model can blow or fill one cubic feet with air. In the literal sense, this also refers to the rate at which a dryer model gets water off your dog’s coat or hair. Is blow drying a better method than air drying my dog? Do they have a significant difference? Although you can always choose or opt to air dry your dog it can actually lead to more disadvantages. If you let your dog dry, it means you are leaving him wet for a longer time than if you just decided to blow dry his or her coat in the first place. When you leave him wet for a certain period of time, he or she is more prone to shivering and to attracting dirt. 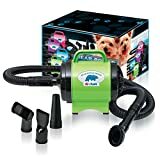 Is it okay to use a blow dryer as an alternative for a dog dryer? The answer is none other than no. One of the obvious reasons is that blow dryers are made for the sole purpose of drying human hair. Humans and dogs are also designed differently. To be more specific, blow dryers are too weak to be able to fully reach the undercoat of your dogs and dry them properly. More than just this, human blow dryer’s steam is too hot and can even cause rashes among your dogs. 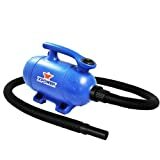 What are the common types of dog dryers? The three types are handheld which is light, low pressure which is usually standing and forced-air which is equipped with handheld nozzles. And the winner for this round goes to the Metrovac’s Air Force Commander. This device is one of the most efficient dog dryers out there. As a high-velocity dryer, this model is able to speed up the process of drying your dog’s coat. It utilizes the airflow technology and as a result, it is able to reach both the undercoat and outer coat at the fastest speed possible. It also comes with two adjustable speed settings and only uses a motor to regulate the temp of the air. As for the structure, this model is made of sturdy steel but it very light and portable.